Welcome to The Dark Side – We Have Tools! 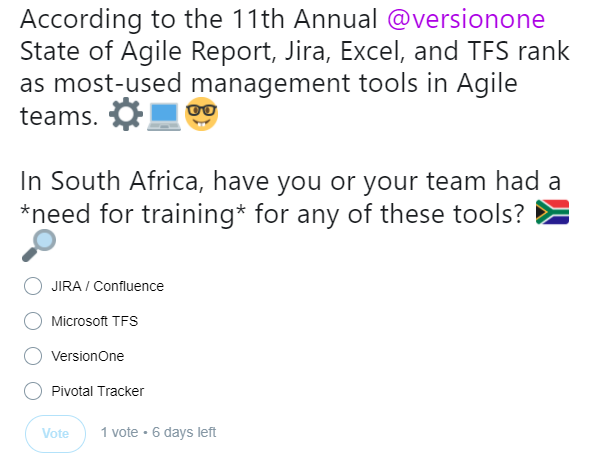 “A fool with a tool is still a fool”, or so the saying goes… yet there is a smorgasbord of agile tools available in the market. The fact that new ones keep popping up and the existing ones are thriving must indicate the popularity of and distinct need for these tools. However, often just saying the word “Jira” can strike fear in a developer’s core and make an agile coach’s heart sink right into their shoes! Are digital agile tools really that evil? Agile tools were designed to assist agile teams, and even the Agile Manifesto value which states “individuals and interactions over processes and tools” does not state no tools or no processes are to be allowed. The key here would be how the tool is used. What are some of the benefits digital agile tools? What are some of the pitfalls of digital agile tools? If we are going to use a tool to reinforce old behaviours like “command and control”, these tools will always be seen as vehicles of dysfunction, but if we can put our heartfelt focus on making the changes required in organisations, and use a tool only where needed for additional support, these tools might just end up being true enablers of change. It could well be a worthwhile step towards long-term sustainability, if, instead of pushing the use of a tool, we energise our teams to embody the values and principles, with any and all tools there to support their journey towards success. Adam Craker – Business Day Adam Craker – The Big Small Business Show – What a purposeful business is?